The Drill Lock Decoder utility is used primarily for designers selling drills online. 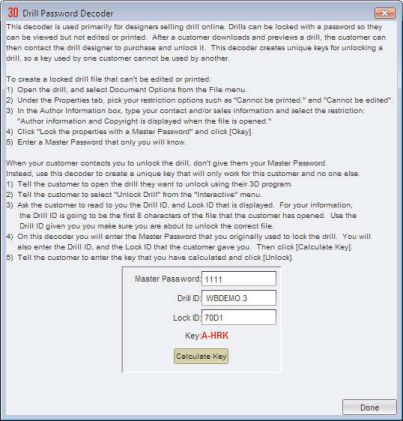 Drills can be locked with a password so they can be viewed but not edited or printed. After a customer downloads and previews a drill, the customer can then contact the drill designer to purchase and unlock it. This decoder creates unique keys for unlocking a drill, so a key used by one customer cannot be used by another. Open the drill and select Document Options from the File menu. In the Author Information box, type your contact and/or sales information. Under the Properties tab, pick your restriction options such as Cannot be printed and/or Cannot be edited. Choose to Lock the properties with a Master Password and enter it. The Master Password is the password that only you know. When your customer contacts you to unlock the drill, don’t give them your Master Password. Instead, use this decoder to create a unique key that will only work for this customer and no one else. Remember the Master Password because you will need it to create the unique key for your customer.